We devour stories in this house. Book after book, and unless you put a stop to it, you could be sat on the sofa reading all day. We make up silly rhymes, act as our favourite characters and generally love language. I’m therefore feel pretty confident we’ve got preschool literacy wrapped up. 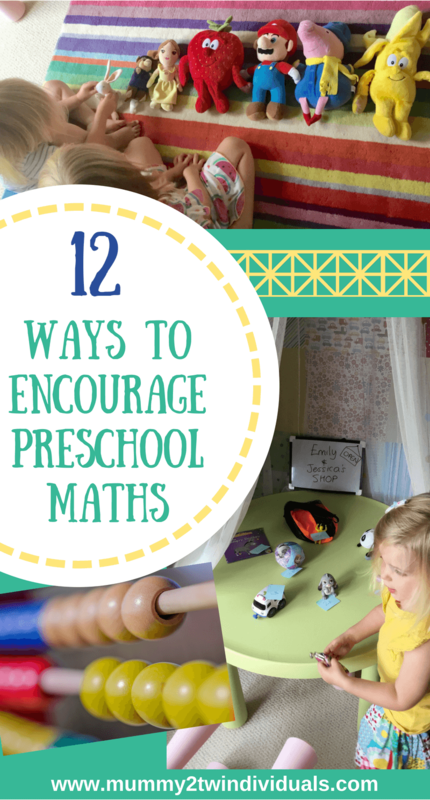 Maths on the other hand, is an area that comes less naturally in our day to day play but it didn’t take much to find some simple ways to incorporate more numeracy skills into our everyday lives. After a quick look at the Early Years Framework, I discovered lots of the recommended activities for preschoolers were things we could do at home easily. Numbers are all around us and the more we’d look, the more we see them. Go on a number hunt to see what numbers you can find. Initially focus on single digits and then move onto numbers to 20. You’ll see them on road signs, food packaging, board games and more. As children get closer to school age, introduce them to numbers written as words such as ‘four’. 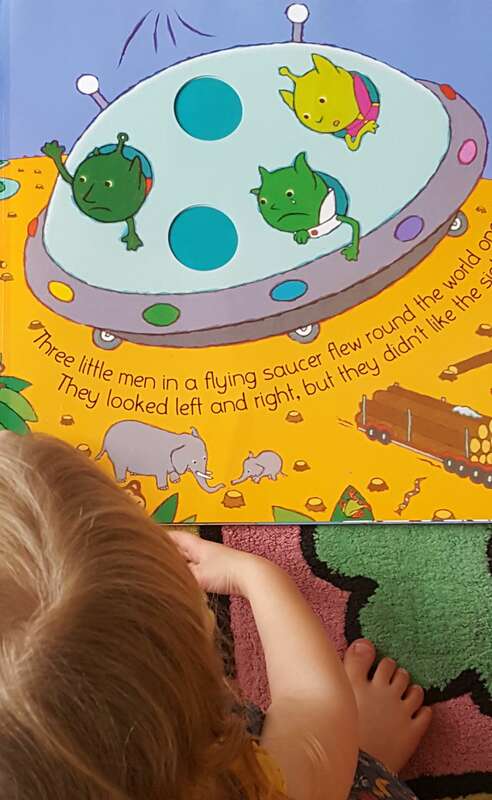 So many children’s songs have numbers and patterns. 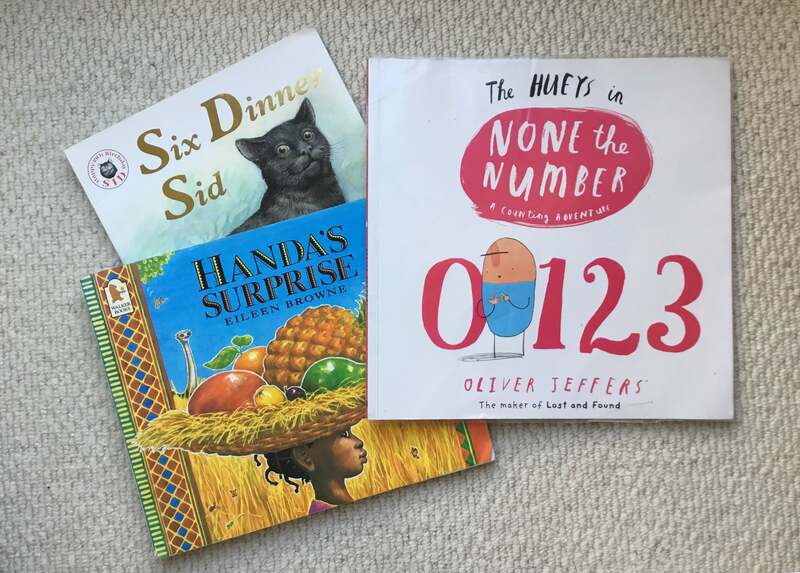 They also encourage children to hold up the corresponding number of fingers and begin to associate numbers with something tangible they can count. Here are a few we sing. Children love playing shops and you don’t really need much to play. 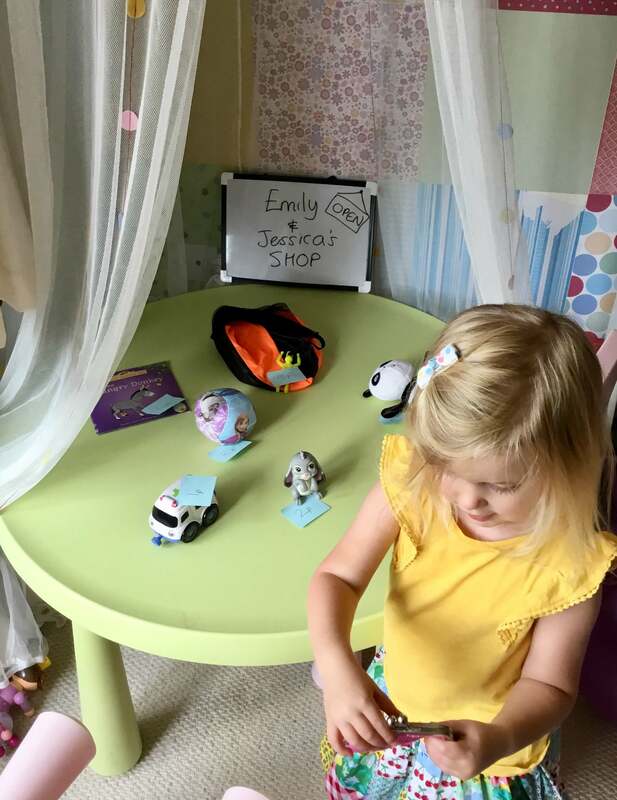 Simply gather a selection of toys to be for sale and arrange them on a table. Depending on the stage of the child, items can be exchanged for a random amount of coins that could be counted. Alternatively, you could use post-it notes to assign prices such as 1p, 2p, 3p and then empty the coppers from your purse to pay for toys. Wherever possible get little ones to help get things out or give out things that could be counted. For example at dinner time, ask how many people are eating and then they can count out the correct amount of knives and forks. When you have visitors, children can ask who would like a drink and count how many. Start to spot early number patterns on a walk. Point out how the house numbers don’t go up as 1,2,3 etc. Can they figure how they do and what the next house number might be? This is great introduction to odd and even numbers and also counting in twos. Measuring ingredients is a great way to compare weights. Get children to hold a bag of flour and an egg. Which is heavier/lighter? We picked up a cheap set of traditional weighing scales with the metal weights which are ideal to get a feel for weight. Even with digital scales, children can look at the numbers and see what ingredients weigh. Anything that involves manipulating pieces into their correct position, encourages hand-eye coordination, patience, trial and error and an understanding of orientation. Children quickly learn to rotate pieces and can look for pieces that are the wrong way around. You can get jigsaws with just two pieces and as they progress so can the number of pieces. Either in the garden or bath, provide containers of different shapes and sizes. This introduces children to the concept of capacity. Look at a tall, thin container and a wide shallow one. Ask children which they think holds more water. 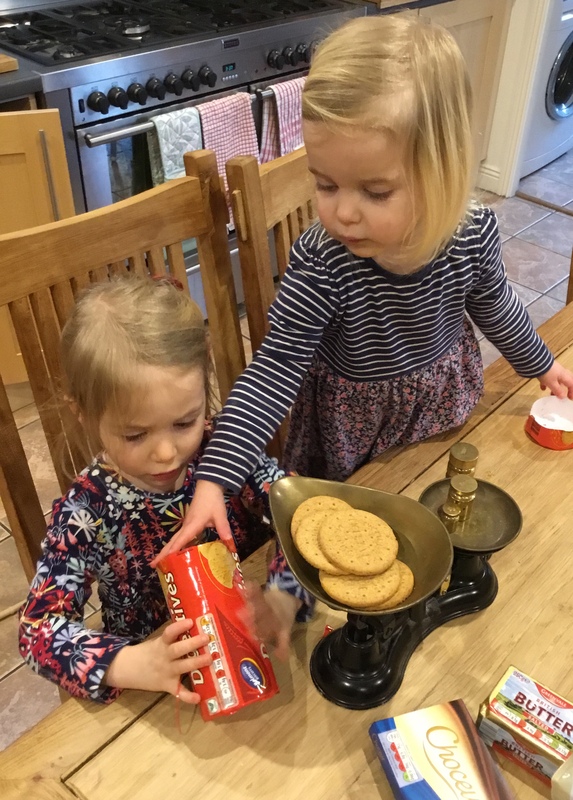 Just allowing children to experiment by tipping from one container to another shows that some containers hold more than others. 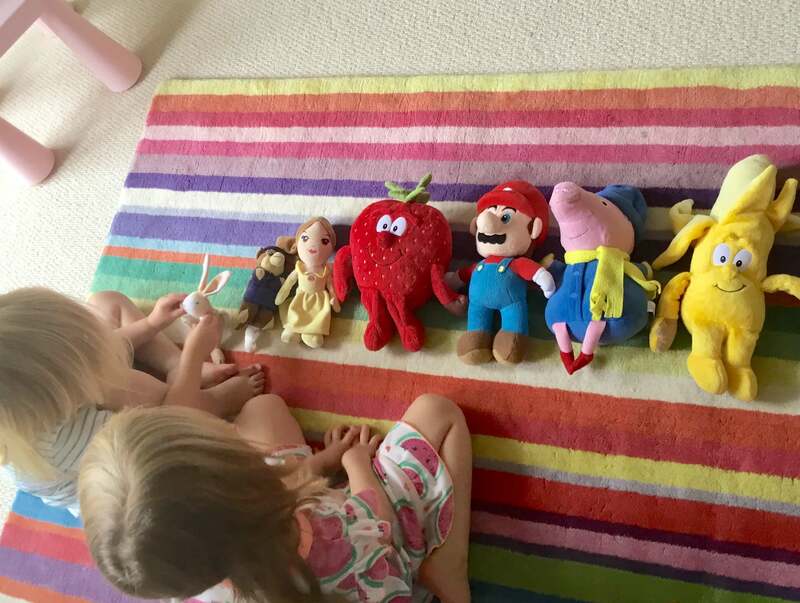 Getting children to put toys back into the correct place not only helps keep their things organised but it also develop their sorting skills. On any given evening we will have a selection of soft toys, play food and some kind of construction kit strewn around. Getting everything to fit where it should takes spacial skills and an understanding of order. Technically not a sat nav but just maps on my phone makes for great maths discussion in the car. This dead time is perfect to identify numbers on the screen. We especially like to count down how many minutes until we reach our destination. As annoying as the commentary, I keep this switched on as it reinforces directions and positional language such as left, right, next, before, after.